23 Nov 2018, 12:25 p.m. Transit Life is a research monograph authored by David Bissell (Associate Professor, University of Melbourne). In the introduction, Bissell puts forth a challenge: to think differently about everyday commuting. Thinking differently, in this context, could mean to think about ‘how our everyday journeys to and from work are entangled in complex webs of relations with other people, places, times, ideas, and materials’ (p. xix), and how the ‘unexceptional activity’ of commuting ‘becomes exceptional’ (p. xv). Across six thematic chapters, Bissell offers a detailed, nuanced, theoretically robust and empirically rich analysis of commuting in Sydney, Australia. By focusing on one city, the book is able to offer the types of details that enable the complexity of everyday urban life not only to come through, but to become central to the stories being told. The titles of the six chapters –‘Impression zones’, ‘Fizzing intensities’, ‘Squeezed transitions’, Experimental interruptions’, ‘Impassioned voices’ and ‘Stranded expectations’ – offer a glimpse into the diversity of intersecting topics to which the book attends. It is the taken-for-grantedness of commuting journeys, juxtaposed with the detailed and complex intersections of practices, socialities, spaces, infrastructures, policies and regulations, enablement and constraint which make such journeys possible, that makes Transit Life such a compelling read. In Bissell’s own words, ‘few activities that bead our everyday lives have earned such dubious notoriety as commuting’ (p. xiii). But rather than framing commuting as necessarily bad (busy trains, traffic jams) or good (open roads, ‘me’ time), Bissell unravels the complexities of commuting journeys and shows how these mobilities are tightly interwoven with everyday lives, with family dynamics, with identities and subjectivities, and details the multiple ways through which ‘commuting journeys actively change us’ (p. xix). This is done with honesty to the ‘richness and drama’ of the research encounters, and therefore avoids ‘overly neat and packaged accounts’, with interpretations ‘teetering on the brink of saying something different, meaning something different, feeling something different’ (p. xxxvi). From bodily adaptations to promised infrastructure, Bissel touches upon the range of people, processes, decisions, practices and materialities that enable and constrain everyday mobilities in Sydney, and in doing so, offers novel insights that engage the reader, and have far-reaching implications. The commuting practices we are made privy to in Transit Life range from relatively short (in space and time) and easy (single mode) commutes, through to Alice’s six-hour commute ‘which involves a walk, then a bus, a train, then another train, then a bus, then a walk’ (p. 103). But rather than focusing on the duration or complexity of Alice’s commute, Bissell draws our attention to how Alice interprets and makes sense of her commuting spaces, their histories and her sense of place as she commutes. These unexpected detours from the familiar journeying of commute stories help to foreground the experiential dimensions of mobile lifeworlds. Another example is found in Chapter 5, when Bissell offers an insight into something hitherto neglected by commuting scholarship – the role of drive-time radio, more specifically, the ‘sense of companionship’ offered by shared radio listening, creating a ‘dispersed, mobile community of listeners’ (p. 128). 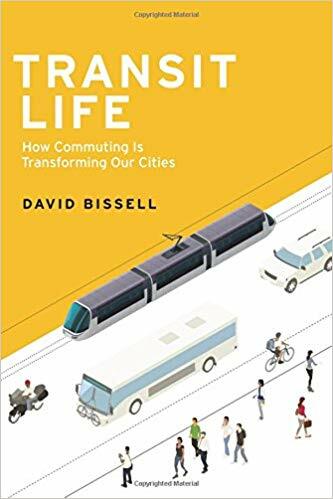 In doing so, Bissell complicates the socialities of commuting practice, and shows how single-occupancy drivers may be engaging with other commuters, and participating in story-telling, news reporting, chit-chat and much more. A sense of weariness – bodily, emotional, experiential – intersects many of the stories being told throughout the book. Bissell shows how such weariness manifests across temporalities, bringing together recollections of last week, yesterday and today, together with anticipated weariness of tomorrow, next week, next year. But also pays attention to the expected, intended, hopeful future mobilities, with participants drawing attention to promised infrastructure changes, or intended relocation, as strategies by which commuting – particularly tiresome commutes – can/will be overcome. This weariness is interwoven in processes of ‘getting by’, of everyday survival, from micro-sleeps in laybys to weekend planning that allows for recuperation and preparation. And how, then, by way of bodily capacities and mood management, the commute filters through social connections, and in particular, into family time. Missing key events, with associated guilt and a sense of failure, articulated by interview dialogue with Eva become part of her (commuting) life story. Commuting is not a footnote, but at the very least a sub-heading in her life story. This perspective of commuting, aptly captured by the title –Transit Life – illuminates gaps in dominant policy discourse of the temporalities, spatialities, flows and rhythms of commutes and teases out spaces for complicating the role of commuting in everyday life. Bissell’s delicate narration of the empirical material that underpins Transit Life takes seriously the sensitivities of talking about the everyday. Unless subject matter is explicitly deemed to be ‘sensitive’, we often overlook the impact, the emotion and the power of talking about so-called ‘mundane’ practice. Bissell shows us how practices of ranting and of disclosing ‘painful secrets’ turned him into a de facto ‘commuting counsellor’. This is important because it signals the immense privilege of qualitative engagement for topics that are interwoven with everyday life, but that may not register as priorities, the significance of which may be obvious for some, but less so for others. In this way, Transit Life offers students, junior and senior scholars alike, an important reminder of the care that must be taken in undertaking such detailed fieldwork. David Bissell’s passion for this topic is palpable. I challenge you not to get excited too. As we read about Claire, Kim and Mike, as we learn about their experiences, their decision-making, their lives, it provides a space for reflection upon our own practices, and highlights how commuting is anything but mundane, and how aggregate trends and flows often used in urban decision-making obfuscate as well as simplify everyday mobilities. And few would not agree with Bissell that, ‘it is much more interesting to learn about how exactly people make up their journeys than to try to find and define underlying orders, rules and structures’ (p. xxxvi). Transit Life speaks of empirically, theoretically and conceptually diverse topics that unify in their recognition of and sensitivity to the complexities and intricacies of everyday mobilities: of everyday transit lives.